Disclaimer: This e-book was written in 2009 prior to spam filters such as Penguin and Panda. We hope to have an updated version for 2016 soon – please subscribe to the right for updates. 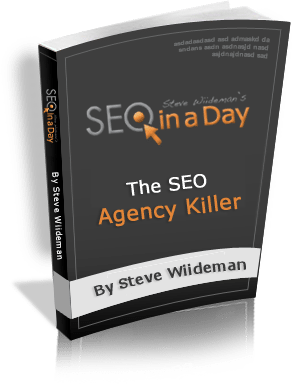 Get the eBook Called The SEO Agency Killer! How to create an attractive blog from scratch. How to easily conduct advanced keyword research, to discover the search terms that will pull interested prospects to your blog. How to install the six most important SEO plugins that will start pulling traffic to your blog right away. You’ll also learn how to properly write your “title tags” and “meta descriptions”, so your blog posts will get noticed by your potential clients. You’ll also learn how to connect your blog to 10 of the most important distribution sites, so your blog posts will get instantly distributed across the Internet just as soon as you publish them! SEO in a Day, my SEO e-book can help you learn how to analyze, optimize, develop and promote your website. After reading this SEO e-book you will not only know how to rank higher in the search engines, but you may also see a dramatic improvement of quality traffic to your web site. This once free SEO e-book is filled with over 35 pages of strategies on how to Analyze, Optimize, Develop, and Promote your website using search engine marketing best practices. Handy checklists reside throughout the e-book, so you can skip all the details and go straight to your personal SEO to-do lists if you like. Also included in this e-book are valuable links and resources such as SEO tools to help automate some of the time-consuming optimization tasks. See why several thousand people have downloaded this SEO e-book and saved thousands in online marketing costs. Below are a couple of videos from people who have read the strategies and received limited oversight from me. The FTC says I have to tell you that results will vary. However, every person I’ve talked to who has used the SEO in a Day strategy has nothing but good things to say. I spent several months compiling all of the best practices I learned over the years and included them in this one of a kind SEO e-book. Moreover, there are dozens of links to SEO resources included as well. It takes more than reading a few SEO newsletters to become savvy at search engine optimization. It takes trial and error, persistence and a fundamental understanding of SEO Best Practices. This e-book not only provides an indepth study of the technologies available to you but provides actual strategies to help you succeed with your SEO strategy one step at a time. In fact, one of the more frequent comments I get from SEO e-book purchasers is how much they enjoy having the comprehensive checklist at the end of each chapter. Once you’ve read the e-book once or twice, you should be able to sit down behind your computer, checklist in hand and optimize your site quickly and efficiently.